Hundreds of platforms provide their data in JSON, CSV, XML, TXT and other popular data formats, which can be used for reporting. When included in your report, this data can uncover great insights on how to manage a particular platform you are using. Supermetrics proudly presents the Custom JSON/CSV Connector for Google Data Studio: an easy-to-use tool which helps you pull data in JSON, CSV, XML and text formats to create visually beautiful Data Studio dashboards. 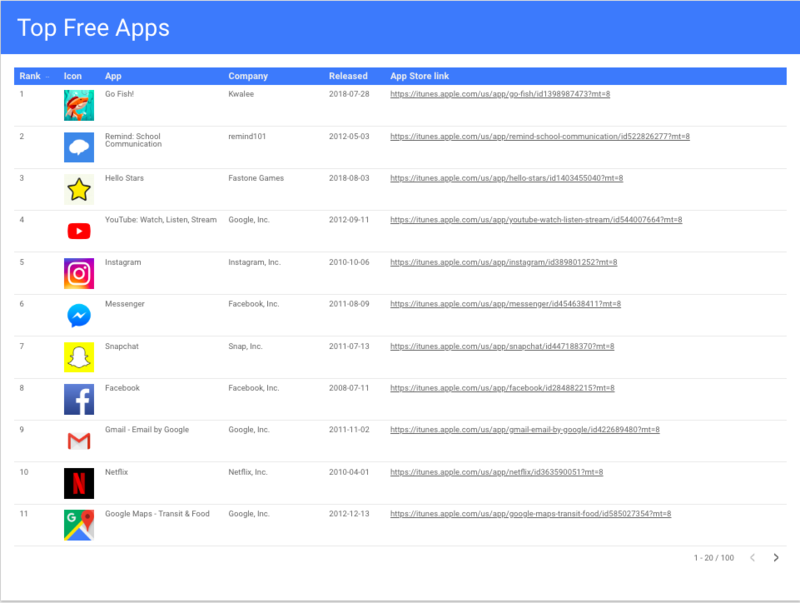 This vastly expands the use cases for Data Studio, as you can now use it for reporting any source that provides data in one of these formats, even if no one has yet built a dedicated Data Studio connector for that source. The JSON/CSV connector is a very powerful tool which can be used in many different ways. Below we will describe some use cases along with examples. Let’s start! The custom JSON/CSV Connector is a perfect tool to help you pull data in case there is no Supermetrics integration for a particular platform. These platforms can range from call tracking systems and calendar apps to CRMs and databases. The main conditions are that the data source you would like to use provides the data in a supported format (usually JSON) and that you have an API key so that you are able to access your data. The API key is usually accessible from the account UI of a particular platform (each platforms’ API documentation should tell you how to obtain it). For example, if you have your data in Favro, a planning and collaboration app, you can easily visualize progress of different tasks in Data Studio. Visit Favro’s API page and familiarize yourself with what kind of data can you fetch using your API key. You can see what stage each task is at and who is responsible for a specific project. This overview helps you see whether there are bottlenecks in your workflow so you can easily remove them. You can use public data available from open APIs to monitor general trends and changes. This information can be weather details of a particular location, currency exchange rates, stock trading, popular songs or news digests, just to give a few examples. If you are investing in Bitcoin, Ethereum, Litecoin or any other cryptocurrency, you know the importance of monitoring exchange rates, market trends and related news to make smart investment decisions. With multiple publicly available APIs, you can easily pull together a useful dashboard which will help you monitor all the needed data on a daily basis. 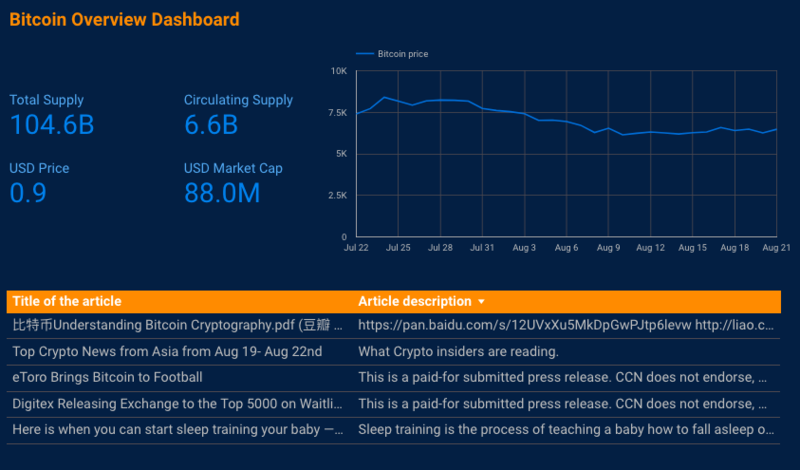 Below is an example of a simple Bitcoin report, where you can see the key metrics visualized with scorecards, a trend of the Bitcoin price over the past month and a Bitcoin-related news feed. Pro Tip: In order to display the app icon as a picture you will have to change the data type for this dimension in Data Studio’s report editing view. You will find a comprehensive step-by-step guide on how to do this here. As we have already discussed earlier in this article, if a particular platform is not supported by a dedicated Supermetrics connector, Custom JSON/CSV is here to help. After you have fetched the data with the JSON/CSV connector, you can merge it with marketing data pulled using other Supermetrics Data Studio connectors. For example, LinkedIn Ads, Twitter Ads, and Facebook Insights to see the overall effect of your marketing efforts. Let’s say you use a particular applicant tracking system (we will use Greenhouse for this example) which helps optimize the entire recruiting process. With the help of data collected by this platform, you can see where people came from to fill in your application, how many of them have filed the application and sent it, how many candidates were invited to the interview and then hired. You advertise this application form page via LinkedIn Ads by running feed PPC campaigns. By pulling data from LinkedIn Ads you can see the marketing metrics as well as cost data for every campaign. 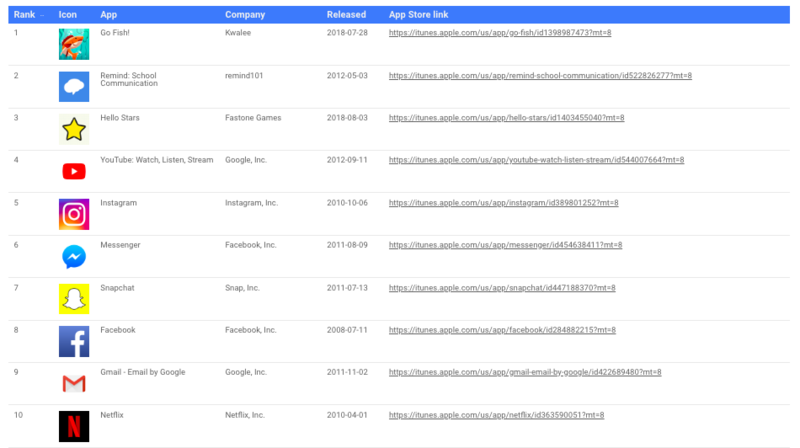 When joining that with data pulled from Greenhouse using the JSON/CSV connector, you can see which campaigns resulted in the most valuable applications. This way, you can adjust your ad spend to ensure you invest in ads with high ROI and get the bigger picture of how your budget is spent on recruitment. 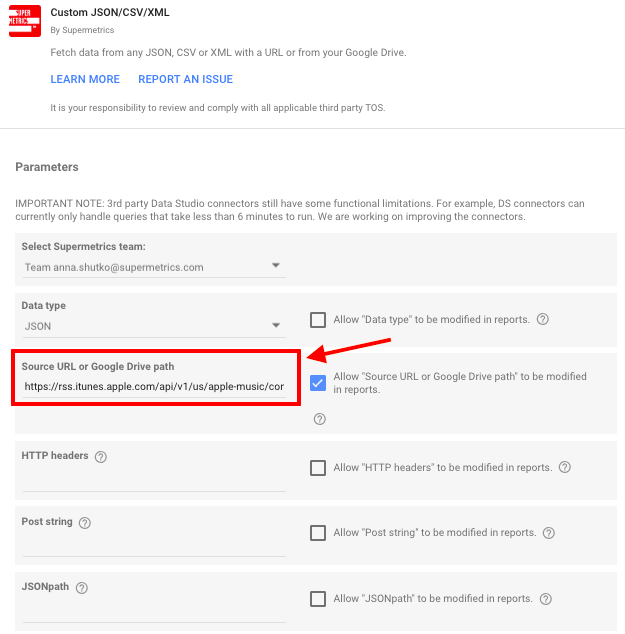 Supermetrics Custom JSON/CSV is a great new connector for Google Data Studio. In this article, we have discussed how with the help of this connector you can fetch data from sources not supported by Supermetrics, create reports which use public data, and combine all those metrics together with data from other marketing and analytics platforms to create comprehensive overview reports. There are many ways in which you can use the Custom JSON/CSV connector and the best way for you to feel the power of this integration is to try it out yourself 🙂 Happy reporting!